The Campfire What do you do when it all goes wrong? This week we are please to change things up a little bit. This yarn (and the beautiful photos that accompany it) was written by one of our customers, Peter Wright, who while holding the copyright to this story and the photos has kindly allowed us to share here. Even though he didn’t use it, we bet he was glad to have the safety net of off-road recovery. Do you like to document your travels in the same way? Shoot through your articles to campfire@club4x4.com.au and we’ll gladly publish them! It was always going to be a slow trip across the Simpson. We were planning to smell the roses, well, maybe some cane grass and catch a glimpse of a wren or two. We had a route from west to east planned that included a couple of nights at Dalhousie with some walks out to a few of the less visited springs in the area and a night at the Spring Creek Delta lookout. From there the plan was to meander slowly along the Rig Road with no particular schedule and no particular plan. We were travelling in our OKA motorhome in company with friends in a Canter. None of us had crossed the Simpson before although we have been fortunate to have toured most areas of Australia over many years and our friends had not long before completed a road trip to Scotland from Australia via China, Mongolia and Russia and back via Turkey, India and Myanmar, so we had all had to contend with the occasional unplanned minor breakdown or diversion from time to time. Camped along the Rig Road. Dinner, undisturbed in the middle of the track. We turned north onto Knolls Track, spent most of a day exploring the Approdinna Attora Knolls and surrounding areas and then we were back on the French Line, with all its traffic. The following day, I was negotiating a moderate dune when there was a “bang” from the rear of the vehicle. Not a good sound. Something had broken and that was going to be bad. It did not take long to confirm that it was either an axle or the rear differential. A little more investigation showed that it was the rear LH axle. It had broken just 100mm from the outer flange. A most unusual failure position (which later investigation suggested was due to a fault in the axle, but that was no consolation at the time). 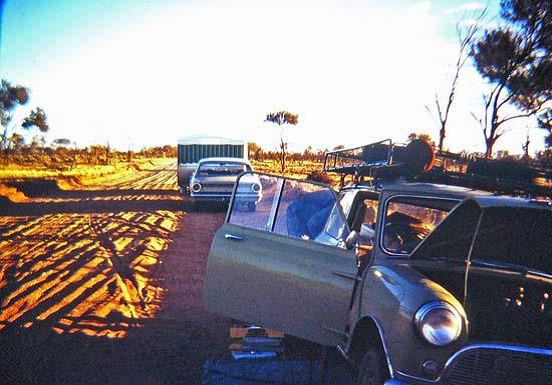 Many years ago, Margaret and I were driving a Mini 850 from Adelaide to Darwin on the still to be sealed Stuart Highway. We were following a semi, keeping well behind to stay out of his dust, when he pulled over and stopped for no apparent reason. By the time we had caught up to him, he was out of the cab, had lifted the bonnet and lighting a small fire off the side of the road. We asked if everything was OK. He said he thought he might have a flat tyre, but was putting the kettle on before checking. When the fire was going and the kettle was on, he took an iron bar and walked around the truck, giving each tyre a clout as he went. When he returned, he confirmed that he did indeed have a flat, but before attending to it he made his cuppa and drank it quietly and calmly seated on an old log next to the fire. Only then did he attend to the flat which he fixed completely and refitted to the truck before having a second cuppa and then proceeding on his way, relaxed and refreshed. I have never forgotten that truckie. The Stuart Highway, 1967. The truckie. By now, our friends had stopped on the top of the previous dune. We walked back to their truck and they put the kettle on. We discussed the options available to us. We were 20km west of Poeppel Corner on the French Line. Option 1. Drive/tow using the Canter to tow us and using the front wheel drive of the OKA with the rear tail shaft removed. Once in Birdsville we would be able to drive home in front wheel drive without too much hassle. The down side was that we were planning to go east to Brisbane rather than home to Adelaide, so this would mess up the rest of our trip. There was little doubt that we could do this and it was a cheap and immediate option, but it would put extra strain on both vehicles. Option 2. Call up Barnsey and get a recovery to Birdsville. Easy and obvious. That might cost $5 or $10,000, but we had this great recovery insurance from Club 4X4, so that would be no problem and this was exactly the reason we had taken it out. Then we could drive back to Adelaide as in Option 1. Option 3. As per options 1or 2 but to effect a repair at Birdsville by fitting a new axle there and then continuing east according to our original plan. This had some merit so we telephoned our OKA parts supplier in Melbourne to establish the timing associated with getting a new axle sent to Birdsville. He confirmed that he had one in stock and estimated that it could be in Birdsville in about 3 working days (plus a weekend). We ordered it on that basis and then re visited our earlier options. Option 4. 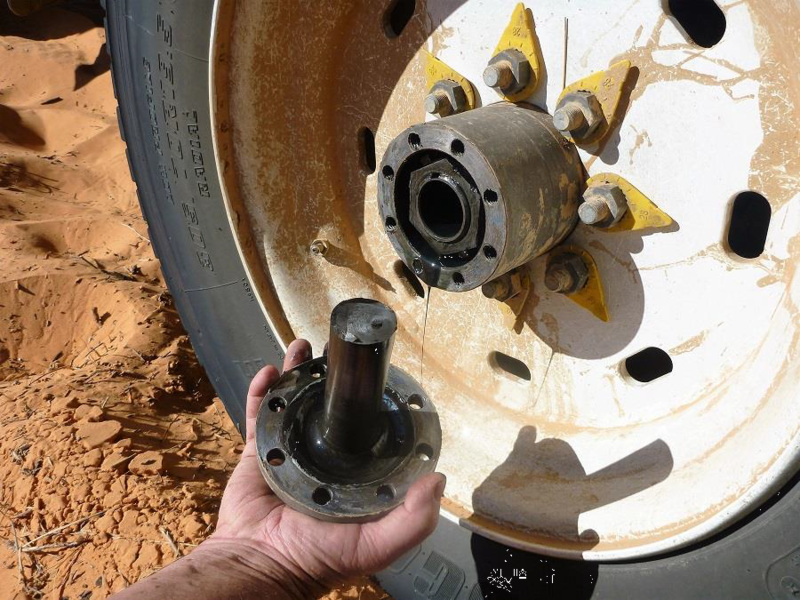 Our friends volunteered to make the drive to Birdsville and back to us with the new axle and we could fit it right where we were. No dragging vehicles through the desert, no stress and we could wait right where we were. We were here to enjoy the desert, an extra week would be no imposition and we would get to continue our planned trip to Brisbane. So that is what we did. 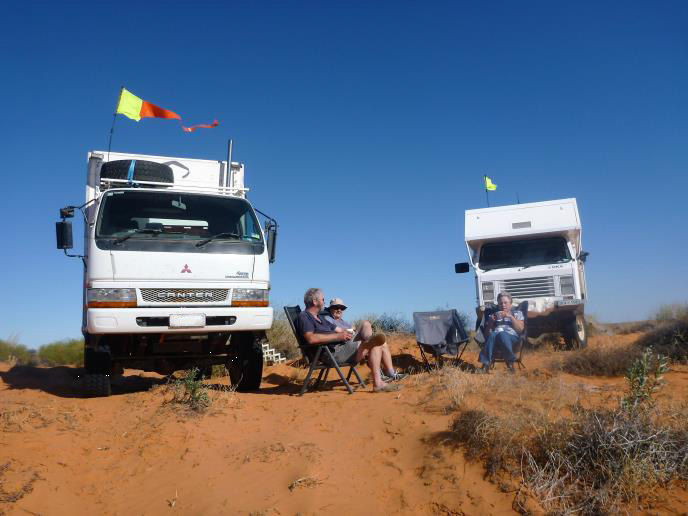 We all waited 5 days until it was confirmed that the axle had indeed arrived in Birdsville, our friends made a three-day round trip to bring it to us, we fitted it in a few minutes and continued our trip as planned. The decision making process had taken about 2 hours and a couple of rounds of coffee. We spent an extra 8 days on the French Line enjoying the desert, seeking out the wild life, chatting to the passers-by and rating the dune climbers attempts out of 10. Our camp site for 8 days on the French Line. All in all, an experience to be savoured for its great memories rather than as a disaster as it might have been seen by some. And thanks to an unknown semi driver on the Stuart Highway many years ago. Great story Peter. 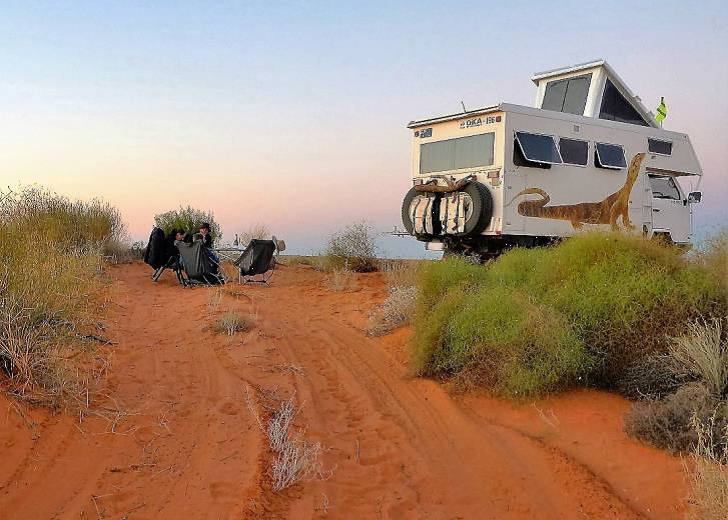 We lead tag tours in the Simpson Desert and did stop to chat to you when you were camped on the French Line. Glad it all worked out in the end for you all. Thanks Graham. I recall you coming through. It was a busy time on the French Line with lots of traffic heading to the Finke races. We will be back again next year. I remember reading of a similar episode when a 4×4 was towing a trailer. The trailer tyre went down and the driver immediately launched into changing the tyre without stopping for the cuppa. After not having the correct wheels brace size for the nuts on the trailer, they immediately launched into plan two by modifying the wheel brace to fit. The wheel was finally changed. That evening over a cuppa, it was decided to take a good look at the tyre. This was done and a simple plug repair followed, air was added from his compressor and he had it fully repaired in about 20 minutes tops. Why did he go into so much wasted time and effort? A) He did not have a cuppa to think it over. This story and yours are both well worth remembering. Q) Why did the Canter go in and out of Birdsville? Surely Barnsey, the P.O. or an agent could have looked out for the axle arrival and any 4 wheel driver would have been more than happy to drop it out. Whatever – a good story and a good ending for all. Good question Denis. We had a sat phone but it was often problematic and we had someone in Camberra who did a great job tracking the parts for us, and while we considered that I think it just one more thing that we did not need to deal with remotely from the middle of the desert. It does also raise an interesting insurance question. Sometimes (maybe often) it would be better, more convenient and a lot cheaper to get the parts and the mechanic to the break down than to get the vehicle to the mechanic, but that is not what the insurance covers at this time. As it turned out, we spent $1,000++ that was not covered by our recovery policy and saved the underwriter several thousands of dollars. We have no problem with that as it suited us at the time, but maybe there are options there that Club 4X4 could discuss with the underwriter that could provide a more flexible cover and save some claim dollars at the same time? Win win. A good friend Jack Absalom who I think most people remember used to give tips on outback travel and he always used to make a cuppa before attempting any repair. Good story Peter but lucky you and or your friends knew how to remove and refit. If it had happened to me I’d probably still be there… or waiting for someone who knew what to do. Tony, we were very lucky that the axle broke where it did. They usually break very close to the inboard end through the splines and then getting the short bit out can be problematic (unless you are lucky with a magnet stuck onto the end of a broomstick). As it was, Margaret sacrificed a pair of salad tongs and we could grab it easily and pull it out. Fitting the new one really was a 5 minute job (12 minutes actually I think, according to the official results of the tats lotto that was running at some work place in Canberra). Cool story, reminds me of a similar experience we had at the Pinnacles, near Cervantes WA about 35 years ago (sorry no cuppa, just water, but similar scenario), I was in a ‘Sandman’ panel van (our van was at Cervantes caravan park); when leaving the pinnacles the LSD (differential) broke, no one around, we (Sue and I) were by ourselves in the middle of nowhere back then, hadn’t seen anyone all day, not many new about the pinnacles back then, very hot so had plenty of drinks of water, walked around scratching head for an hour or so, too far to walk back at that stage, didn’t have much light left by then, figured the only thing I could do was pull both rear axles out, put wheels back on and hope for a tow, only took an hour or so to do the job and got ready to bed down for the night; an hour or so after sunset, a Ute load of gray fisherman from a remote location came along heading to Cervantes for a beer; got a tow and ended up at Cervantes for 3 to 4 months, Limited slip diff took over a month correspondence with Perth to fix, got to know the locals, worked on gray boat for a couple of months, a fantastic experience, thanks for the reminder, regards Croaky. 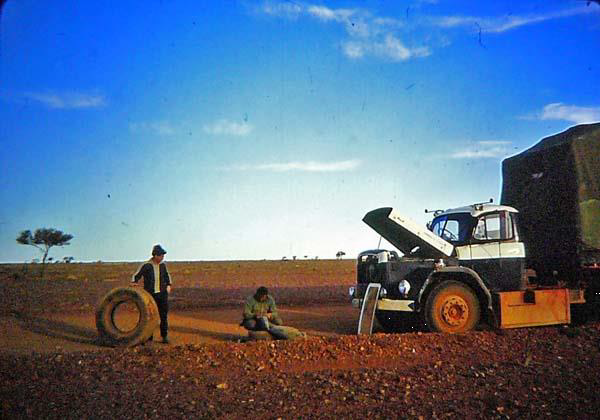 Many years ago in the 60s while still a young bloke and driving trucks in the North West of WA all the roads were dirt and with cross ply tyres a truckie always carried at least 4 spares, so at the end of the day the first job was to light a fire make a cup of black coffee then fix the punctures usually at least 3. The main reason for putting off the job was to stop the hands from shaking after holding on to the steering wheel, no power driving over the corrugations. Thanks for your story.